The primary objective of the weekly blog posting is to help you prepare for the very difficult Part II of the EVP, PSP and CEP exams AND to help you develop the PAPER for your CCC/E exam. The SECONDARY purpose is to provide you with a forum where you can explore applying the tools and techniques you are learning about to your real day to day problems encountered in your work and/or personal life. I expect between 300 and 500 words each week, starting with Saturday, 30 July and continuing through the Saturday prior to the first exam in March of 2012. Pick topics related to your paper and/or to any real problem or opportunity you face in your work or personal lives and apply any of the tools/techniques used by cost engineers to solve those problems. Demonstrate how you are using these tools and techniques with your colleagues and professor. For tracking and reporting purposes, name each with the Week (W1, W2, W3 etc); followed by your name or initials and then the topic you are writing on. Put an underscore after each element. A Joint Operating Company is planning to construct an offshore development project which consists of two wellhead platforms with 4 legged and 4 slots of development well for each and water depth is about 70 m depth, 2 x 24” pipeline laying for a total of 20 km and central processing platform. The objectives of this project are to sustain the overall of its field’s production, to develop reserves at about 150 MMstb and to achieve 1st production target date in end Q4-2014. The project management team has identified the issues/high potential risks during project schedule review. The issues and challenges that they are going to face are monsoon season which will fall from January – April (Q1 + 1 month), resource constraint especially on drilling rig that will only be available in end Q3-2014. The project team is currently formulating the options/scenarios of the schedule which is the best one will be selected to ensure the project objectives can be met. Option-1 : Assuming that the fabrication work will be going smoothly and MCD date is as per planned, the installation work will fall under monsoon where it will lead to cost exposure due to weather downtime at about 15 Mill USD. Assuming that the rig is available in Q3-2014, target for 1st production still can be met. Option-2: Accelerating fabrication by adding direct manpower task force and expediting long lead items for early delivery will result the MCD is 2 months ahead of schedule which enables to proceed with the installation work before the monsoon. However the accelerating program has impact on cost exposure at 10 Mill USD. Drilling activity will be done as per planned and the 1st oil date can be realized on time or even could be ahead of schedule. The analysis on each option shows that both option-1 and option-2 are able to meet the 1st production target date in Q4-2014 and also able to sustain the current production rate but option-1 has higher cost exposure than option-2 due to weather downtime. The option-3 is out of the criteria since it cannot meet the 1st oil target date that lead to the deferment of the production with cost impact of 25 Mill USD. It obviously can be concluded that the option-2 meets the defined criteria, so that project team has to select option-2 as the best option /scenario which is to be reflected in the schedule development and as a basis for executing, monitoring and controlling the work . Once the schedule and project plan have been established and agreed by all project team as per selected scenario option, the project team has to strongly monitor and control to achieve the MCD of each wellhead platform in nine (9) months instead of eleven (11) months to allow the installation work to be done before monsoon so that subsequent activities also will be going smoothly as per planned. Project team needs to ensure number of direct manpower as required and to expedite the long lead items as per ROS (Required On Site) date as well as ensuring the availability of the drilling rig by Q3-2014 in order to ensure the 1st production target can be met. 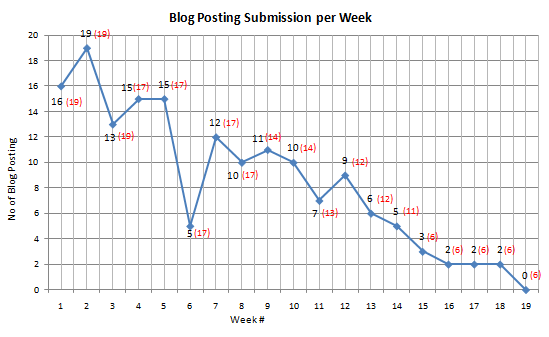 For the past 19 weeks, the performance of the CoolCCE blog posting is not progressing very well or in low performance and tends to be decreased every week. This condition can be described by the following performance trend based on a total number of blog posting submission per week. Based on the analysis of the desired outcomes of each alternative above, the 1st issue can easily be resolved by both option 1.1 and 1.2 ( pick up the idea easily and fast) instead of option 1.3. On the 2nd issue, even though both option 2.1 and 2.2 are meeting target in timely manner, but option 2.2 has high probability of acceptance level by the client and good quality of the blog as it follows the recommended problem analysis structure of engineering economy. All 3 options on the 3rd issue can meet timely target but only option 3.3 that has good time balance and able to eliminate the time constraints. Lastly on the issue no.4, the option 4.1 is obviously is not good option, while option 4.2 can make us stay consistently and increase probability of passing the exam. Provided deep analysis and comparison above, It can be concluded obviously that the best ways of mitigating all the issues/challenges are to discuss with other good member and consult with the mentor to pick up good and fast idea of the blog posting ( option 1.1 and option 1.2) ,As much as possible to take the real life of experience to obtain the good quality of the blog and increase acceptance level by the client (option 2.1) , consistently doing assignment after office hours and during weekend in order to eliminate time constraint (option 3.3) and stay focus on exam study concurrently practicing the assignment to increase probability of passing the real exam (option 4.2) . In order for us to gauge once those are implemented, whether the above recommendations are successful or not are to measure no of blog posting acceptance by the mentor and no of timely blog submission. The event to do distance learning with fellow team members is an opportunity to learn and exchange ideas for what we have achieved from the theory and as a crosschek to our understanding of the subject. Week 19.0 – Henry – What’s going on with our Cool CCE Group Blog Posting? For week 19 blog posting topic, our mentor has asked us to conduct an analysis on why all of sudden the productivity of blog posting is decreased. Therefore, the following is my analysis about the case. The Cool CCE Group Blog Posting has been started since October 2010 with 19 members and now we are in the week # 19 with only 6 members left. Based on the above condition it can be seen that the performances of each week particularly in the last weeks are not quite well. The result is declining. Even at the date I wrote this blog in Monday and Tuesday night, none of the member of the group has posted their blog for week #19. The question is why it is declining? The requirement from our mentor to pick our own case study from the problem in our real life or an opportunity from our own life following the template from our Engineering Economy, 14th Edition, page 27, table 1-1. The requirement to use an Engineering Economy sometimes is a challenging way to be performed especially if we have to produce a quantitative or qualitative analysis of those alternatives using the tools/techniques that we found in our reference materials. My experience, sometime I have difficulties to provide a feasible alternatives and outcome of each alternative especially if I do not have a back up or reference data. I have two blog being rejected due to these cases; one is about insurance topic and the second one is about exchange rate problem. In both of this blog I have very limited information of the alternative outcome. What I wrote in my blog was, provide/ found a problem; propose a solution without any other alternative solution and then the blog was rejected. Therefore, when I have to develop another blog, then I have to be sure first that I have many alternative of solutions. However, other problem that I have faced it, is I have lack of topic, and in the following number I have described further about this issue. In line in item number 1, to find the right topic is also a challenging way especially for topic that can cover the requirement of the blog posting. Off course I still can conduct a research for the solution but it will take longer time and then I have to do a prioritization with other assignment which is Problem Solving assignment that by the fact it would need more time to read, study and practice. The problem solving assignment is another challenging activity to be performed mainly when we have to study the chapter before we can answer it, especially in the Engineering Economy topic in which we have to read, learn and understand the formula and the example before we can start to answer it. To me, read, learn and understand the formula and the example relatively spend a lot of my time. In correlation to item 1, 2 and 3, my work load in the office is another obstacle I have to face in order to fulfill my assignment in the Cool CCE group. I guess, this alternative is the most important key to solve the problem. Because if we enthusiastic to solve the problem with more will and effort, it is expecting that the problem can be minimized. Off course it wills impacting our live either personal or family live. But it is only for one remaining month anyway. Discussion and share information/ question, or request an advice to our mentor perhaps can help us to solve the problem. Discussion and share information/ question with other cool CCE member can also become another solution on how to solve the lack of topic. Our mentor concern on the condition that the blog posting activities are decreased lately is because of the problem that, in my understanding, is because of the requirement to follow Engineering Economy methodology on page 27 table 1.1. Moreover, the lack of topic, other Cool CCE assignment and current workload in the office are the other problems that I think become an issue with all Cool CCE members. Therefore, the good solution to solve this problem is by providing a strong willingness and more effort to do better blog result, time management and to interface and discuss/ request an advice to our mentor. This option shall become a good solution in order to get a better result on the blog posting development. It will be using the used components with the specification from stock of its ex-projects. The machine that can maximize profit of the company (the most economical machine). Based on the calculation and analysis, it is obvious that machine type-A can give the higher profit per day ($ 5,075 per day) compared to type-B which is only $ 4,480 per day. In term of Present Worth, the machine type-A is the sound one as its PW@i=MARR 15% is positive. In term of quality of the machine components, type –A quality is better than type-B since the machine components of type-A is totally new while the type-B is from the used components/materials where it is a high risk of any modification/upgrading work. It can be concluded that the engineering team should recommend to the management to select the precast concrete machine type-A for the investment as this machine is the best option that meets all the defined criteria. In summary, the analysis on production capacity and rejection rate as well as the usage of present worth method really help team to justify and select the most economical option in the construction investment. Once the machine is assembled and being operated, the team has to monitor and control the actual production rate per day as designed unless otherwise the expected profit will not be achieved and also strengthen the market in order to sustain and grow the business. Running projects require project managers to be able controlling the cost allocated for the project. In my company, we usually define these costs in each WBS elements we have created for each projects. For each services scope of work we deliver, we define several costs. 1. Internal Costs (Labor Costs). 3. Primary Costs (Other Costs). From the services costs we have defined, I believe the biggest contributions come from the Labor costs. These costs consist of man hours spent by the technicians, engineers, installers, project team etc. Basically these are the costs that are spent to pay the project team members who are doing the project. From my current observations, only few project managers in my company that generates report on controlling and forecasting the resource allocation including its costs. I think this lead into problem that each project is not accurately controlling their resource allocation as well the labor costs. It ended up by making wrong forecasts for resources and we tend to keep lots of resources which we may not always utilize. We have not yet use a correct method to define this labor costs control, performance and forecasting. At present, in my company the management is currently highlighting the resource plan and controlling issues as well as their cost allocation. We have to be realistic, that currently we are doing efficiency in many areas, including labor costs efficiencies. However, at present I have not yet seen any project managers that utilize a specific method to be able to control their labor cost and make forecast. Below is the figure I have taken from one of a project that create a report providing a resource plan, however the information provided in this figure does not produce informative conclusion for the decision makers. Specifically, it does not show any labor costs information. A possible alternative solution for a project is to utilize a method that allows the project managers producing more informative report on labor cost control. There are 2 methods that are proposed by AACEI which helps project managers to control the labor costs: Earned Value Method and Unit Rates Method. The two methods will allow project managers to measure labor inputs, outputs and report processing. The 2 methods can also provide variances and deviations on labor costs. This will help the management to identified labor cost overruns and invoke them to make corrective action soon as possible. One of the methods that can be adopted is the Unit Rates Method. This method allows the project management team to compare the actual inputs and outputs. It supports the project managers making comparisons at the cost level, total project level or at any level in the WBS. It is also simple and easy to utilize and able to provide labor costs forecasting information. Firstly, I identified the labor cost estimation for the activities required in MSC roll out. I gave 2 activities as examples (Site Engineering and Installation). On each activity, there are sub activities which details each tasks needed to be performed. After completing the estimation, during the roll out of the project, the project manager can utilize the next table and calculations for controlling labor cost. The table below shows how each sub activities labor costs are now being monitored its budget, actual, forecast and EAC. The calculations and formulas are adopted from AACEI method: Unit Rates Method. See table below for details. 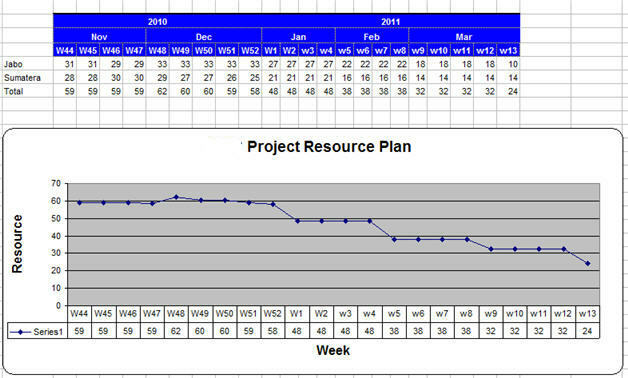 By using the table, project managers can make analysis on the project’s labor cost performance in details. They can make forecast, and measure their current project’s labor performance. From the table they can see which activity need more resources, which one are efficient, and which ones are not performing well. The information now is more useful for the management team. The tables can be modified as preferred usage. From the 2 method given by AACEI, I choose to utilize the unit Rates Method. It allows the project managers to show the budget money can be spent for labors on a specific projects or scope of work. It allows the project managers to calculate actual money have been spent for labors. It allows the project managers making forecast on costs that need to be spent for labors. It allows the project managers to calculate EAC for labor costs. This method uses the unit cost and production rates for estimating, making it simple and familiar for the project managers to utilized. In conclusion, the Unit Rates Method can be utilized in telecommunication projects, specifically to control the labor costs. Having this kind of method used in my company can benefited the project managers in controlling labor costs. It also provides them with more comprehensive and improved resource usage and cost control reporting. Not only the data provide the numbers of people being utilized in the project, but also total hours spent and the money spent. Sulliven, W. G., Wicks, E.M., Koelling, C. P., et al. (2009). Engineering Economy (14th ed.). New Jersey: Pearson Education. Orczyk, J. Joseph. (2010). Skills and Knowledge of Cost Engineering (5th ed. ), Project Labor Cost Control (pp. 21.1 – 21.12). Morgantown: AACE International.